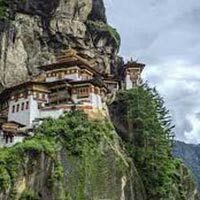 Bhutan often revered as the "Land of the Thunder Dragon" or 'Druk Yul', is still regarded as one of the last "Shangri - La's" in the Himalayan region because of its remoteness, its spectacular mountain terrain, varied flora and fauna and its unique ancient Buddhist monasteries. Textile Musuem - Thimphu : Closed on Government Holidays and on Sun and on Sat open from 9.00 a.m to 4 p.m Institute of Zorig Chusum (Arts & Crafts School) - Thimphu: Closed on Sun & Government Holidays and on Sat open from 10 a.m to 12 o’clock. 6. Arts & Crafts School (Zorig Chusum) - Thimphu - Rs. 100 Per Person. Costs are valid for Indian nationals possessing valid Indian passport or voter’s ID and is subject to 5.00 % GST. Original Indian birth certificate issued by Indian Govt Authority required for Minors. Indian tourists traveling via Non - Indian sectors (Kathmandu /Bangkok/ Singapore/ Dhaka etc) need valid passport while from India, they can travel either with Valid passport or Voter’s ID card. For NRIs, OCI or PIO card holders, different tariff & policy applies in accordance with norms of Tourism Council of Bhutan. Please check with us separately on this. Should you require any further clarification on the same please do not hesitate to let us know. After breakfast, drive to Buddha Point (Kuensel Phodrang). Located at a short drive from Thimphu city center, visitors can get a good overview of the Thimphu valley from the Buddha point (Kuensel Phodrang). You can pay your obeisance and offer prayers to the Buddha, the largest statue in the country and then walk around and take a glimpse of the valley. Then, drive to Takin Preserve. The Takin is national animal of Bhutan, and looks like a cross between a cow and goat. Later in the afternoon visit Trashichhoedzong, “fortress of the glorious religion”. This is the center of government and religion, site of monarch’s throne room and seat of JeKhenpo or Chief Abbot. Built in 1641 by the political and religious unifier of Bhutan, Shabdrung Ngawang Namgyal, it was reconstructed in 1960s in traditional Bhutanese manner, without nails or architectural plans. Evening time can be spent strolling through the government-run Handicrafts Emporium and local crafts bazaar, to browse through example of Bhutan's fine traditional arts. Here you can buy hand-woven textiles, thangkha paintings, masks, ceramics, slate and wood carvings, jewelry, interesting items made from local materials. After breakfast, drive to Punakha / Wangduephodrang across Dochu La. Located at a height of 3,088m/ 10,130 ft, Dochula is a scenic location with Chorten, Mani wall, and prayer flags which decorate this highest point on the road. If skies are clear, it may be possible to see the following peaks from this pass in the order left to right: Masagang (7,158m), Tsendagang (6,960m), Terigang (7,060m ), Jejegangphugang (7,158 m), Kangphugang (7,170 m ), Zongphugang (7, 060 m ), a table mountain that dominates the isolated region of Lunana - finally Gangkar puensum, the highest peak in Bhutan at 7,497m. Afternoon visit Punakha Dzong or (Palace of Great Happiness), built in 1637 by Shabdrung Ngawang Namgyal, at the junction of the Phochu and Mochu rivers. This majestic dzong served as both the religious and the administrative center of Bhutan in the past. It measures some 600 by 240 feet and has a six-story, gold-domed tower. Inside are courtyards and religious statuary that hint at the depth of history and spiritual tradition embodied here. Your guide will illuminate your understanding of this intricate culture that is exotic to us, though long established here. Later in the day excursion to Chimi Lhakhang. The Chimi Lhakhang, situated on a hillock in the centre of the valley, is also known as the temple of fertility. It is widely believed that couples who do not have children and wanting one, if they pray at this temple, they are usually blessed with a child very soon. A walk through the village near the temple will give you rare glimpses into the daily life and lifestyle of the villagers. After breakfast drive back to Paro descending back down from Dochu La, follow the way back up the dramatic Wang Chhu and Paro Chhu river valleys, before crossing through Paro town towards the north end of the valley. En route visit Simtokha Dzong, one of the oldest fortress of the country and known as the place of profound tantric teaching. This dzong now houses a school for the study of the Dzongkha language. Later in the day after checking into hotel, proceed to visit Ta Dzong, originally built as Watchtower, which now houses National Museum. The extensive collection includes antique thangkha paintings, textiles, weapons & armour, household objects and a rich assortment of natural and historic artifacts. Then walk down the trail to visit Rinpung Dzong, meaning (“fortress of the heap of jewels”), which has a long and fascinating history. Along the wooden galleries lining the inner courtyard are fine wall paintings illustrating Buddhist lore such as four friends, the old man of long life, the wheel of life, scenes from the life of Milarepa, Mount. Sumeru and other cosmic Mandala. After breakfast, driving excursion to Chelela pass. Chele la (pass), at an elevation 3,988 meters is considered to be one of the highest motorable passes in Bhutan. About an hour's drive along a thickly-forested road, is this Pass-a botanical paradise. The pass provides stunning views of the sacred mountain Jomolhari and Jichu Drake. It is also marked by hundreds of prayer flags fluttering in the wind. Here, visitors can see cascades of wild roses, purple and yellow primulas, and swathes of deep blue iris covering the forest floor. The top of the pass bloom with rhododendrons in a variety of colours-pale pink, deep pink, burnt orange, mauve, white and scarlet. Later en route excursion to Dzongdrakha Goempa. Often called as mini Takstang Dzongdrakha is a cliff-side temple complex on the western side of the Paro Valley. Four shrines make up the complex, dedicated to Drolma (Tara), Tsheringma (Goddess of Longevity), Guru Rinpoche and the Buddha of the Future, Maitreya. Local oral tradition states that when Guru Rinpoche first came to Bhutan, he came from Nepal, first landing at Drakarpo, and then Dzongdrakha before arriving at Taktshang (Tiger's Nest) farther north up the valley. 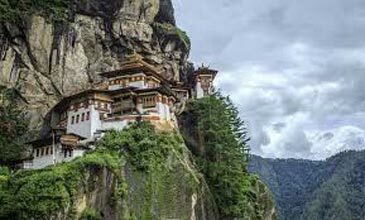 Located approx 20 minute drive from Paro, these temples are built on a cliff above Bondey village but the walk is not as strenuous as Taktshang. From the road, it take only about 30 minutes walk to reach here, through forests of rhododendron and oak trees with white monkeys on it. Dzongdrakha also hosts an annual Tshechu (festival) that takes place the day before and the day after the larger Paro Tshechu held at Rinpung Dzong near the main town. During the festival at Dzongdrakha, one of the main blessings takes place when the chorten (stupa) of the past Buddha is opened so that attendees are blessed by the relic held within. The Dzongdrakha village has numerous temples and is known for most of their men being either fully ordained monks or gomchens (lay monks who don’t take vows of celibacy). Ironically it is the women who work in the fields and are the bread earners unlike in any other part of the country Afternoon drive to Drukgyel Dzong, a ruined fortress where centuries ago Bhutanese warriors fought against Tibetan invaders. The snowy dome of sacred Chomolhari, "mountain of goddess'' can be seen in all her glory from the approach road to the Dzong. After early breakfast at the hotel, drive to the airport for flight to your onward destination.